The Titanium Power Tape X30 Discs contain a higher concentration of Aqua-Titanium compared to the standard Titanium Power Tape Discs. Are you buying Genuine Phiten Products? Make sure to purchase only from Phiten Authorized Dealers such as Sports TLC who proudly display this seal. 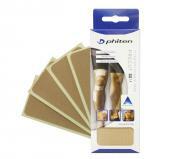 Genuine Phiten products are specially crafted to improve your body's energy flow. Do not waste your money on counterfeit goods that will not provide any energizing benefits. If the necklace has "Titanium Sports" or "Titanium Twisters" written on it, or if the price is too good to be true, it is a knock-off and you are getting ripped off! FREE SHIPPING ON ALL ORDERS - 1st Class Mail or Priority Mail! Design your own unique Tornado Necklace - comprised of 2 Classic Phiten Necklaces twisted into one necklace. Choose your own colors for the Clasp/Grommets at no additional cost! The strands of this revolutionary necklace are coated with Phiten's Aqua-Titanium™. Its core contains micro-sized Titanium balls, as well as carbonized Titanium. The necklace helps relieve stiffness in the shoulders and neck and eventually helps stabilize your whole body. Now available in 16", 18", 20" and 22" lengths. Available Colors: Black, White, Gray, Navy, Royal Blue, Carolina Light Blue, Purple, Forest Green, Optic Green, Pink, Maroon, Cardinal Red, Bright Orange, Burnt Orange and Gold. Just $62 and FREE SHIPPING! Phiten Triple-Twist or Triple-Braid Custom Necklace: Design your own Triple Necklace! Triple necklaces are comprised of 3 Classic Titanium Necklaces twisted or braided together into one necklace. You pick the colors! 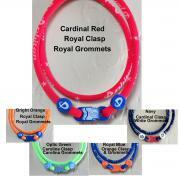 Choose your own colors for the Clasp/Grommets at no additional cost! Match your favorite MLB, NFL or College Team. Available in 16", 18", 20" and 22" lengths. Available Colors: Black, White, Gray, Navy, Royal Blue, Carolina Light Blue, Purple, Forest Green, Optic Green, Pink, Maroon, Cardinal Red, Bright Orange, Burnt Orange and Gold. JUST $23.00 with FREE SHIPPING! 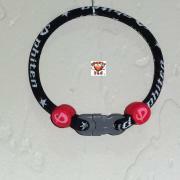 Phiten Tornado Bracelet: Want a Bracelet to match your Tornado Necklace? Try one of these out! Tornado Bracelets are custom made using the Classic Phiten Necklaces and help relieve pain in the wrists and hands. 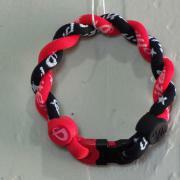 The bracelet also increases circulation and serves to relax the arm. Just $22 - Customized Classic Star Necklace. 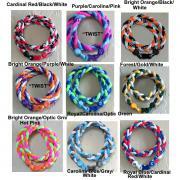 Just $32.00 - Triple-Twist or Triple-Braid Phiten Bracelet. Just $17 -Custom Phiten Bracelet. Pick your own colors of Clasp/Grommets. Mix and match! Just $15.50 with FREE SHIPPING. 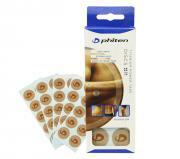 X30 Power Tape Discs (50 Pack). Interested in becoming a Phiten Products Sales Representative for Sports TLC?